The first quarter of 2014 proved to be choppy and surprising one for global investors. The beginning of the year consensus provided little guidance. • Major global equity markets sold off in January, rebounded in February, see-sawed in March and the MSCI World index finished Q1 with a modest 1.4% gain in local currency terms. • Global bonds, which were supposed to underperform as the Fed proceeded with tapering, turned in a surprisingly strong performance. • Emerging Market assets were under pressure early in the quarter as growth disappointments, political turmoil, fed tapering and worries about China's credit bubble took a toll. But in March, as Putin effectively annexed Crimea and China saw the beginnings of what could become a string of corporate defaults, EM assets, in contrarian fashion, regained some lost ground. • Gold, after a horrible 2013, had a stellar Q1, while copper and iron ore, more closely linked to China's slowing growth and credit problems, sold off sharply. • Energy prices rallied on frigid North American weather and geopolitical risk, as the WTI futures price rose to $103/bbl by February 28 and finished March at $101/bbl. • Global growth forecasts have edged down and global inflation has continued to disappoint on the downside, keeping the risk of deflationary outcomes on the table, thereby boosting bond performance. This may all seem confusing, but the common thread may be rising uncertainty, which helped gold and safe-haven assets, but hurt the relative performance of EM assets, equities and inflation-linked bonds. Markets seem to believe that the Fed will continue to taper its QE program but, despite an apparent stumble by Fed Chair Janet Yellen suggesting that the Fed could begin tightening in early 2015, the timing of actual Fed rates hikes has become more uncertain. Even members of the FOMC seem widely divided on how soon and how much the policy rate should be raised. The good news for Canadian investors in global ETF's was that whatever the Fed eventually does, the Bank of Canada continues to send signals that it is in no hurry to raise its policy rate and might even contemplate cutting it. The body language of BoC Governor Poloz clearly seems to be more relaxed about tightening than does that of his Fed counterpart. The result was a further 3.9% depreciation of the Canadian dollar relative to the USD and this tended to make Q1 quite profitable for Canadian ETF investors. The S&P500 closed March at 1872, up from 1859 at the end of February, 1783 at the end of January and 1842 at the end of December. Global equity ETFs posted mixed returns in March. The C$ was virtually unchanged in March, so there was virtually no difference between returns local currency and CAD terms. The strongest returns were in Emerging Markets (EEM), which returned 3.7% in CAD terms. Other equity markets posted less stellar returns, as Eurozone (FEZ) returned 0.6%, Canada (XIU) +0.3%, and US (SPY) +0.2%. Japan (EWJ) significantly under-performed other markets, returning -2.6% in CAD terms. US small caps (IWM) returned -1.2%, underperforming US large caps. Commodity ETFs lost ground in March. The Gold ETF (GLD) returned -3.3% in CAD terms, while the GSCI commodity ETF (GSG) returned -0.2% as copper and iron ore prices suffered from weakness in Chinese industrial production. Global Bonds ETFs also turned in mixed performances in March. EM bonds rebounded to outperform DM bonds. Emerging Market Local Currency bonds (EMLC) were surprisingly the best performers, returning 1.9% in CAD terms. USD-denominated bonds (EMB) returned +0.7%. Among DM government bond ETFs, non-US global government bonds (BWX) were the best performers with a 0.0% return, while US long bonds (TLH) returned -0.3% and Canadian long bonds (XLB), returned -1.0%. Inflation-linked bonds (ILBs) posted mixed returns in March. Canadian RRBs (XRB) returned +0.4%, US TIPs (TIP) returned -0.7% in CAD terms, and non-US ILBs (WIP) returned +1.1%. Corporate bonds posted negative returns in March as US investment grade (LQD) and high yield (HYG) bonds returned -0.5% and -0.7% respectively. Canadian corporate bonds (XCB) returned -0.2%. In Q1, with the Canadian dollar depreciating 3.9% against the US dollar, the best global ETF returns for Canadian investors were in Gold and US long bonds. The worst returns were in Japanese equities. In global equities, the Canadian equity ETF (XIU) performed well, returning 5.6%. The S&P500 ETF (SPY) returned 5.2% in CAD terms and the Eurozone equity ETF (FEZ) returned +5.0%, Emerging Market equities (EEM) underperformed, suffering from Fed tapering, political turmoil, and China’s growth slowdown, and returned 1.9% in CAD terms. The Japan equity ETF (EWJ), suffering from Yen strength and slowing Asian growth, returned -3.1%. US small caps (IWM) returned 4.8%, under performing large caps (SPY). 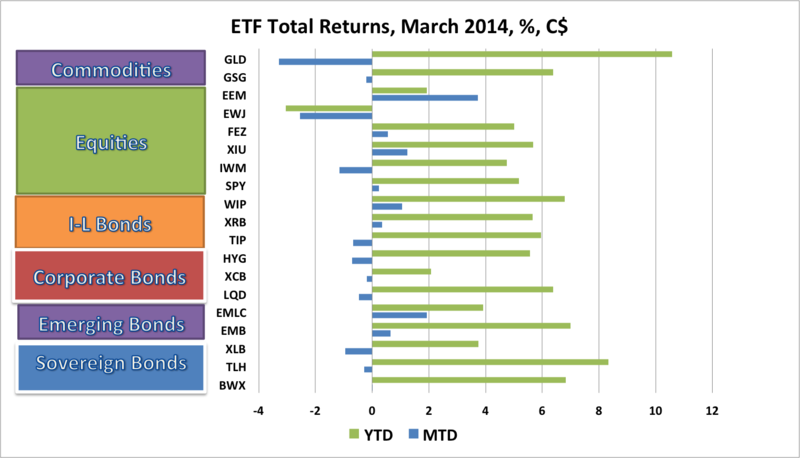 Commodity ETFs turned in strong performance in Q1, aided by the weakness of the C$. The Gold ETF (GLD) returned 10.6% in CAD terms, while the iShares GSCI commodity ETF (GSG) returned 6.4%. Global Bond ETFs, contrary to consensus expectations at the beginning of the year, performed well. Foreign bond ETFs benefited from currency strength relative to the Canadian dollar and long duration bonds benefited from a combination of weaker than expected economic data and safe haven demand. The US long bond ETF (TLH) returned +4.3% in USD terms, and with the weakening of the C$, this translated into a +8.3% return in CAD terms. The Canada Long Bond ETF (XLB) posted a gain of +3.8%. Non-US global government bonds (BWX) fared better, posting a return of +6.8% in CAD terms. Emerging Market local currency bonds (EMLC) suffered from the same problems as EM equities, but still returned 3.9% in CAD terms. USD-denominated EM bonds (EMB) returned +7.0%. Inflation-linked bonds (ILBs) rebounded in Q1 after a disastrous performance in 2013. Non-US ILBs (WIP) fared best, returning +6.8% in CAD terms, while US TIPs (TIP) returned +6.0%. The Canadian real return bond ETF (XRB), benefiting from its long duration, returned 5.7%. Among corporate bond ETFs, the US investment grade bond ETF (LQD) returned 6.4% in CAD terms, while the US high yield bond ETF (HYG) posted a return of 5.6% as high yield spreads widened. The Canadian corporate bond ETF (XCB) returned of +2.1%. In March, the Canadian ETF portfolios tracked in this blog posted only small positive returns, but for Q1, all of the portfolios turned in solid performances. The traditional Canadian 60% Equity/40% Bond ETF Portfolio gained 34 basis points in March to be up 4.2% year-to-date (ytd). A less volatile portfolio for cautious investors, comprised of 45% global equities, 25% government and corporate bonds and 30% cash, gained 28 bps in March to be up 3.7% ytd. Risk balanced portfolios performed well in January, added to their gains in February and were little changed in March. A Levered Global Risk Balanced (RB) Portfolio, which uses leverage to balance the expected risk contribution from the Global Market ETFs, lost 1 bp in March, but finished Q1 with a stellar year-to date gain of 8.9%. An Unlevered Global Risk Balanced (RB) Portfolio, which has less exposure to government bonds, ILBs and commodities but more exposure to corporate credit, returned 17 bps in March to be up 5.4%ytd. 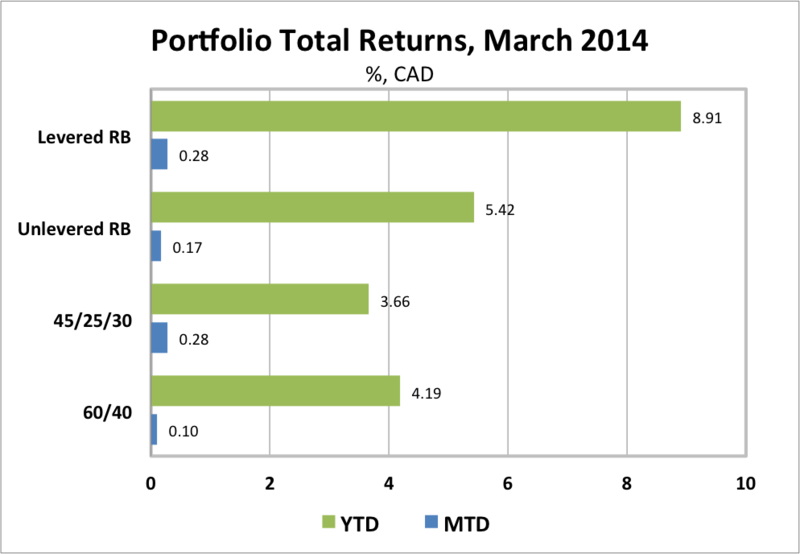 March turned out to be a volatile but relatively flat month for most Canadian dollar portfolios. As a result, the solid year-to-date returns achieved by the end of February remained intact. Developments in Ukraine, including Russia’s de facto annexation of Crimea, added volatility, but did little damage to major equity markets. Bond and Gold ETFs benefited from their safe haven attraction. The situation remains a source of uncertainty and a continuing geopolitical risk to markets. The Bank of Canada, with its policy rate decision in March and a subsequent speech by Governor Poloz, confirmed that the direction of the next rate move will depend on growth and inflation developments. The weather-battered economy contracted 0.5% in December and managed to rebound 0.5% in January, leaving output unchanged from its November level. This slow start to the year will result in a downgrade to the BoC’s growth projection in the April 16 Monetary Policy Report. Core inflation remains stuck at just over 1% and the BoC remains puzzled about the causes of the weakness of inflation. There is little reason to expect a near term change in the BoC’s thinking. In Q1, global economic data was weaker than expected, but much of the weakness was shrugged off by markets as weather related and, therefore, temporary. In April, this assumption will be tested. If the economic data fails to reaccelerate, the resilience in equity markets will be tested. If data do suggest a strong reacceleration, bond markets will be at risk. Concerns about falling global inflation continue. Recent weak inflation readings in the Eurozone and China support ongoing concerns about global disinflation. Emerging markets remain a focus. China has increased the flexibility of its exchange rate setting as it gingerly attempts to let some air out of its credit bubble without seriously damaging growth. Russia’s economy is likely to suffer from G7 sanctions and private sector capital outflows and is vulnerable to a drop in crude oil prices. Political uncertainty remains high in Turkey and Brazil. In a mid-January post on Inflation and Deflation Scenarios, I pointed to Russell Napier’s advice to watch inflation expectations (measured by US 5-year TIPs break-evens), copper prices and credit spreads. In Q1, these indicators, especially copper prices, continued to move, although not yet decisively, toward the outcomes consistent with the deflation scenario. As it turned out, major equity and bond markets drifted sideways in March as global uncertainties failed to abate. This may be a pause the refreshes and gives way to better news on growth and less evidence of disinflation in April. That would go some distance toward validating current high equity market valuations, but would likely cause some reversal of the surprising bond market rally of Q1. Having ample cash in the portfolio remains a good strategy; April is likely to send important signals about the best way to deploy that cash.